You might have noticed that I really like bow ties. (See my previous post.) I appreciate that everyone else is getting on the band wagon. I love Express! So when I started seeing their advertisements showing bow ties I was excited. But upon further inspection I found out that they only sell pre-tied bow ties! Ugh! Really?! 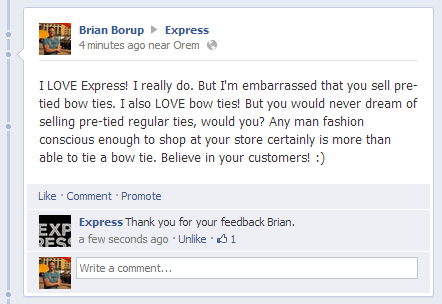 I love that you actually contacted express over this! I have *almost* purchased several bowties from there only to find out that they were pre-tied. Completely ruins it.